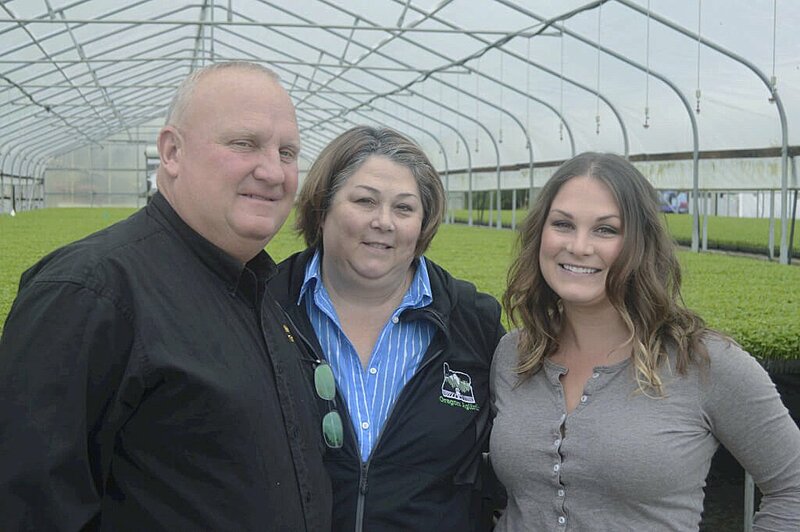 Neal, Pamela and Lauren Lucht of Northwest Transplants in Molalla, Ore., in a greenhouse full of young vegetable plants. Farmers mitigate risk by planting plugs instead of sowing seeds. An aerial view of Northwest Transplants shows 20 acres and 200,000 square feet of greenhouse space. The Molalla, Ore., farm produces 80 million to 90 million transplants a year for commercial agriculture. Molalla, Ore. — In the late 1980s Neal Lucht saw the need to produce transplants for commercial agriculture. At the time, plug transplants weren’t grown in the Pacific Northwest, but he knew such an operation would open many crop opportunities in the region. He and his wife, Pamela, started the company in 1990. Today the business encompasses 20 acres with 200,000 square feet of greenhouse space. They now produce 80 million to 90 million transplants of more than 300 species each year. This puts them on the front line of many newer crops. Their newest crop is hemp. Only this year the state legislature rewrote the law regarding industrial hemp production to allow a transplant producer into the seed custody chain. This year NWT is growing 3 million hemp plants. In the beginning most in agriculture couldn’t see the feasibility of Neal’s early vision. Pamela and Neal’s daughter, Lauren, said growers use NWT’s services to mitigate risk, which is especially valuable for new varieties. “The genetics are too expensive to just throw seed out on the ground,” Lauren said. But it takes people to make the company go. Pamela said finding the best way to work with a new generation of employees requires a different mindset. “The responsibility lies with us to determine how to work with a millennial to have a win-win for both of us,” she said. “We have to be open-minded to change or adapt to new ways of getting the same old job done. “My millennial mindset is about working smarter, not harder,” Lauren said. “My biggest push has been automating payroll; we are currently trialing an electronic face recognition time clock system; eventually we could outsource payroll and not have to do it in office. “I’m not afraid to admit that farming’s a seven-day-a-week job but I would like to have my free time and be able to play and enjoy my life,” Lauren said. “I only have one life to live and I am working on tools that will allow me to manage remotely. Lauren said her participation in the REAL Oregon (Resource Education & Agriculture Leadership) program has helped equip her for the job at hand. “The skills involved can be hard and intimidating, and REAL Oregon provides a supportive environment of your peers where you can learn how to appreciate and highlight and teach people about our industry and our natural resources in Oregon,” she said.